This soup is HUGE on flavor, low in calories, and incredibly healthy. Win, win, win. I forgot to mention - fast! I love it because my kids will eat it without complaint. Oh yes, they complain when something bright orange, other than a candy corn, shows up at the dinner table. It has 249% of your daily value of vitamin A, 8% of your daily value of iron, and 44% of your daily value of vitamin C.
The flavor punch in this recipe comes for Thai Roasted Red Chili Paste AKA Nam Prik Pao that can be found at Walmart it is so common. The brand I bought was Thai Kitchen and I found it in the “Asian foods” section of my grocery store. 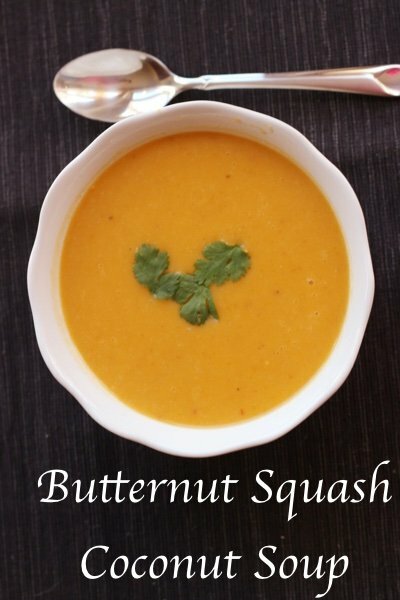 It imparts a salty, spicy, and sour note that is a great complement to the sweet flavor of the butternut squash and the coconut milk. It wasn’t SO spicy that my kids wouldn’t eat it. If you don’t have time to cut up a butternut squash, you can find peeled chunks in your produce section. Buying the pre-cut squash will save you a lot of time. Even with out buying the pre-cut squash, this recipe is super fast. I served it with some bread and a salad. Have you used the Thai pastes? What do you use them in? Heat olive oil and sauté onion and garlic until softened. Add chili paste and fry for one minute. Toss in butternut squash and fry, stirring, for about 3 minutes. Pour in stock and bring to a boil. Simmer for 6 minutes or until squash is soft. Add coconut milk and using an immersion blender, puree soup. Taste to determine if you need to add salt. Serve adding chopped cilantro as a garnish. This looks great! 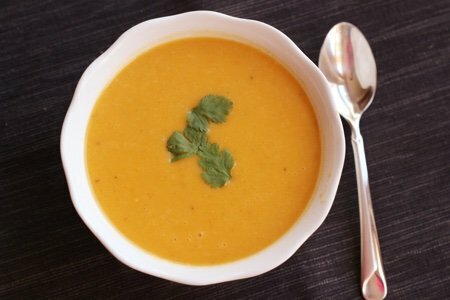 I make a similar 3-ingredient butternut quash soup made with butternut squash, vegetable broth, and curry powder. Easy, healthy, & delicious: how can you go wrong?! Red Thai Curry Paste in Cream of Carrot and Coconut Soup. It deepens the already orange color of the soup while adding the hot, sour, salty taste to balance out the sweet and rich flavours of the carrots and coconut milk. I try to add 1/4 to 1/2 tsp of it to any bowl of soup I have. This looks really good. Except I'm confused, how is it healthy if it has 10.5 grams of fat? Is it the coconut milk that adds the fat? It is very confusing that the saturated fat from animals is not the same as from plants - but they are significantly different. Do not be afraid of coconut milk! @regina - just skip it. The soup doesn't need it. Thanks for your question! I make a roasted squash soup - one pan with onions, peppers, an apple, and anything else you want - then blend with broth. If you don't have a can of coconut milk you can also make your own fresh milk with grated coconut and hot water. thanks for all of the good ideas! I made the soup and it was really great! Thanks for the recipe. I might try using 1/2 almond milk next time with the coconut milk to try to cut down a bit - do you think it would lose much of the flavor ? WOW! Eating this soup for lunch right now! SO GOOD! I never really attempting anything Thai, but love the flavors. Great recipe Snack Girl! This is a winner - so was the banana/chocolate mug cake from last week - reminded me a bit of Vita Muffins. @Leslie - my feeling is that it is worth a try. Taste it and then if it isn't up to snuff - add the coconut milk in. I think it could work. I made this for dinner last night and it was a huge hit! I wasn't expecting it to be so filling but it's definitely a full meal all on its own. I made this last night and YUM. So good and super easy if you buy the pre-cut squash, which of course I did. Will be making this a LOT. Thank you! Lisa, is that 1 pound of peeled and cubed squash or 1 pound squash before peeling & cubing? Thanks in advance for clearing up my confusion. @Phyllis - it is one pound before peeling and cubing - but it isn't going to matter that much to the final product if you have more - you could probably go up to 11/2 pounds and it would work. This soup is so good and I can't believe how fast it was. I threw in a dollop of greek yogurt too. LOVE LOVE this recipe. Omg. I have now made it twice this week. Fast, easy, delicious. I now want to find other recipes you can use the red chili paste in. Thanks Snack Girl.for yet another excellent recipe. One more comment here, most ofamous my"new" "go to" recipes are.from this blog!!! !